Every time a band like Turnover plays in at The Bodega in Nottingham it gets surprisingly busy, see: The Hotelier, etc, but this show was packed to the walls from the second doors opened. Local band Little Bribes kicked things off with their brand of alt pop-punk/emo and played a ridiculously confident set for a band with only a single out. They cover a lot of ground musically, and it works flawlessly. Definitely ones to check out. Teen Brains were up next and brought things back to the grungier side. The set was rather repetitive, but the band are doing a good job at what’s popular right now with some well-crafted songs. Pop-punk band Claws did a better job at injecting some life into the crowd, and played some songs which were catchy and fun. The sound wasn’t too great, though, which let the set down, and it all merged into one by the end. Now, by the time Turnover played, it was quite obviously too packed in the venue. Not the kind where it’s fun and busy, just to the point where people were having to stand behind the doors to even fit in the room. Luckily, they kicked things off with “New Scream” and showed just how much they’ve grown as a band across the past couple of years (they’ve come a long way from that average pop-punk band supporting I Am the Avalanche at Rock City Basement). Even the new songs sounded great, one was a bit faster than anything on the stellar Peripheral Vision and ignited some movement. Tracks like “Take My Head”, “Like Slow Disappearing” and “Humming” got huge singalongs from the crowd. The band eventually closed with “Cutting My Fingers Off” by which point it was boiling and sweaty in the venue. It was a great set showcasing an even better record; they should have just played it in full, though. 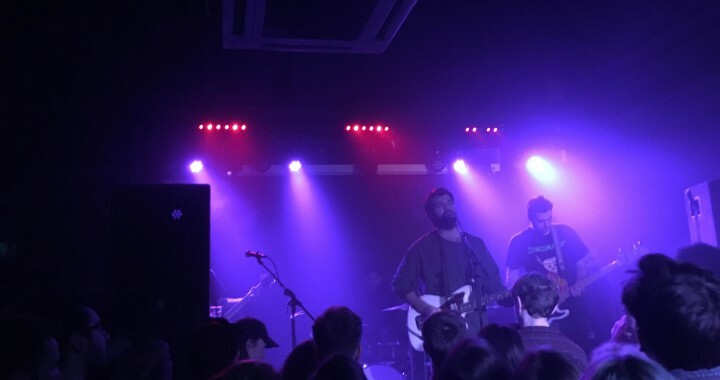 Posted in Live Reviews, Reviews and tagged bodega, claws, little bribes, live music, nottingham, peripheral vision, teen brains, turnover.